If you’re like most traders, you spend a lot of your time thinking about how to improve your trading results and, ultimately, your life. You’re dreaming up new strategies, thinking about stocks you want to research more, wondering how you can implement something you just read, or even just deciding what you want to accomplish tomorrow. I’m guessing a lot of your best ideas come when you aren’t sitting at your computer. Maybe things just pop into your conscious brain first thing in the morning, while you’re still in bed. And then you’ve forgotten them by the time you’ve gotten your coffee and sat down at your desk. Or maybe you get your best ideas while you’re driving. I know you wouldn’t use your cell phone while driving – at least I hope you wouldn’t. But if you wait until you arrive at your destination, that idea will be long gone. Can you at least remember that great idea long enough to park the car somewhere along the way? Ideas can hit you anywhere, at any time. Before you get out of bed, or get to your destination, and lose that great idea forever, here are 5 ways you can quickly capture it and have it ready for you to review and act on by the time you get back to your desk. Of course, they all assume you have a smartphone or other Wi-Fi device. For these suggestions to work, your device needs to be next to your bed, or on your person, at all times. I’m guessing that’s not a problem for you. And it’s a lot easier to accomplish than in the old days of lugging a paper planner with you everywhere. So grab your device, and try one or more of my suggestions below. You’ll never again let those great ideas slip away. Although your phone probably came with a reminder app, anything you enter there just stays on your phone. If you want those notes to be quickly accessible on your desktop, you need something more powerful. 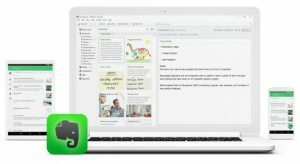 Evernote, available in a free version for iOS or Android, is the go-to app for entering notes by typing or handwriting. Put this app on all your devices and let Evernote sync it to all of them. Next time you’re in a business lunch, write a note or draw a diagram on your tablet, and then go home and pull it up on your desktop. Another great option for saving written (rather than spoken) information is Google Docs and Sheets. Create a document or spreadsheet on your mobile device, then easily save it on Google Drive or email it to yourself. Google Sheets is particularly handy for keeping track of expenses on the road. By the time you get home, your expense report is already done and on your computer. Available for both Android and iOS, Google’s Voice Search is a really quick option for sending yourself an email note. Once your app is in listening mode, say “Note to Self”, then dictate your note. Your phone will send you the text of your note via Gmail. This app is great for those of us with ‘fat finger’ issues. No texting skills needed. If you prefer to save the voice recording (or if the voice-to-text in Voice Search isn’t working well for you) try Voice Memos. This app will send your raw voice recording to any email. It comes pre-installed on most iPhones, and is also available for Android. Skyro is another good option, although it is currently only available for Android devices. Skyro lets you add photos to your recordings. During playback, it shows them at the moment in the recording when you took them. This is great for adding photos of stock charts, new business outlets you’ve just noticed, or scribblings on a napkin. For maximum productivity, let Skyro sync your recordings to Dropbox automatically. In addition to being able to send your recording to your email or the cloud, voice recorder app Rev has a built-in option for transcription. You can upload your recording to a pre-specified location, or send Rev a link. They charge $1/minute to transcribe your recording, then send it to you via email. So if it takes you five minutes to outline a new idea, you could have the whole thing transcribed for just $5, with 99% accuracy and a 24-hour turnaround. This app is great for times when you are speaking in public, conducting interviews, or writing your next best-seller! Since Rev uses humans to do the transcription, there is never a worry about training voice-recognition software to recognize your words. You’re standing in line at the grocery store, spot a cool web page you really want to read, and you’re almost at the front of the line. Now what? The easiest thing to do is to be prepared with one of the ‘read it later’ apps, such as Pocket, Instapaper, or Evernote. But if you don’t have one of those apps installed, just use the ‘Share’ option in your device’s browser to email yourself a link. And maybe add a note about why you want to read it, so you don’t forget. For even more productivity, use a voice command app like Siri, Google, or Cortana to get to your note or recording app. You’ll be able to just say something like “OK Google. Open Skyro.” And you’re ready to record. Whatever approach works best for you, just start using it. You’ll never lose a great idea again.